In the movie, the wizard had a secret to hide. But there are many times in daily life when folks operate behind the scenes for very different reasons. Often it’s because they believe the work they do is more important than any recognition. On Oct. 21, the Boys & Girls Clubs of the Umpqua Valley marked its annual Celebrate Kids event, which includes pulling aside the curtain to reveal its Champion of Youth. 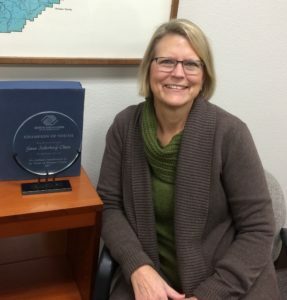 This year, the honor went to Gwen Soderberg-Chase, executive director of Douglas County Partners for Student Success, and an educator in the county for nearly 40 years. Soderberg-Chase would hardly describe herself as a knight. But she readily admits she’s part of a crusade to get out an important message to the youth of Douglas County. Through her work with DCPSS and as a member of the BGCUV board of directors, Soderberg-Chase has been involved with numerous programs and projects designed to help extend those educational opportunities to more kids and families in the region. The vision is that each child in the county will receive effective and meaningful support to achieve economic and social success. With that support, all students can craft individual pathways that will enable them to graduate from high school, complete post-secondary education and/or enter a career. Lake said one of Soderberg-Chase’s valuable community contributions is connected to Be Great By 8th. The program prepares middle school youth for success by equipping them with the emotional intelligence, social skills, academic proficiency and educational momentum to succeed at home, in school and beyond. “Gwen not has been instrumental in developing that program and others for the state of Oregon, but also has helped us create a strategy for our organization in how we expand our programs,” Lake said. He explained that in the case of Be Great By 8th, for example, it would have been cost-prohibitive to open a facility to carry out program activities. By taking a collective approach supported by DCPSS, which touts working together to accomplish common goals, BGCUV was able to reach out to partners to bring the program to the community of Camas Valley. By adopting Soderberg-Chase’s “big-picture thinking,” Lake said local child advocacy groups like BGCUV are able to bring together multiple partners focused on taking youth “all the way through high school to get them to graduate. “And beyond that, to provide post-secondary or trade school opportunities to better their lives as well as those of their families and those in the community at large,” Lake said. As a part-time Umpqua Community College faculty member whose work centers on creating career paths for future educators, Soderberg-Chase often draws on her contacts to plot out the crib-to-career journey championed by DCPSS. She said she’s very aware that it’s not a solo mission. 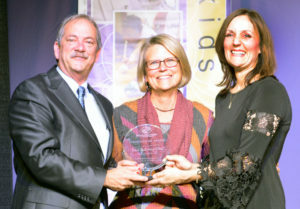 As she accepted her award, she said, Soderberg-Chase was mindful that she was part of a larger effort involving the work, passion and commitment of many people. To find out more about the programs of DCPSS and BGCUV, visit www.dcpss.org and www.bgcuv.org, respectively.